Do not touch the water! This was on our way up to Jiufen. 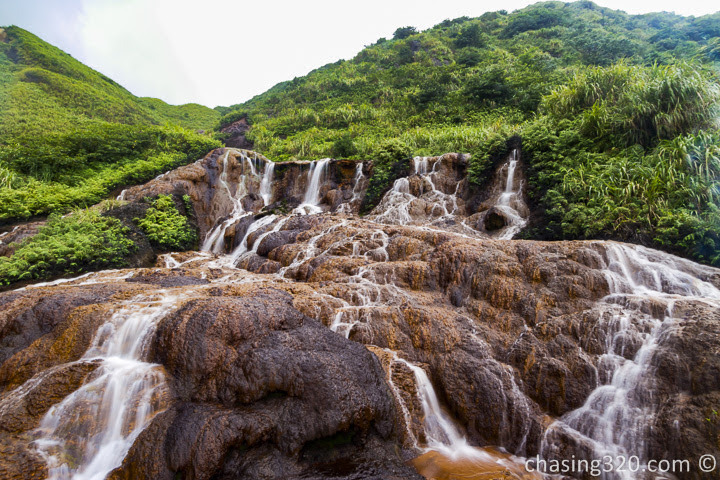 A brief stop to admire The Golden Waterfall, more known as Huangjin Waterfall. Look at the grass which the waters flows thru, all black or dead. This water is poisonous due to the years these hills were used to mine copper, releasing poisonous gas into the air and into the soil. You will get sick and get rashes or worse. Poison aside, this is a beautiful road side waterfall that flows to the sea. Many people come here to take wedding photos and as I stood there in the drizzle, carefully avoiding the inclusion of the couple who were taking their wedding photos. It was drizzly and it was time to head back into the taxi.